In 2011, Dolphin Tale told the real-life story of Winter, the dolphin who lost her tail due to injury and slowly learned to adapt to a prosthetic replacement. 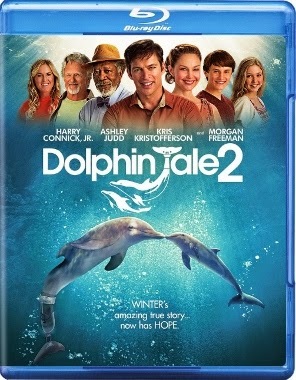 With an all-star cast led by Harry Connick Jr., Ashley Judd, Morgan Freeman, and Kris Kristofferson, plus the authenticity added by using the real Winter (rather than a CG or animatronic dolphin), the film was a genuinely heartwarming hit. In fact, it wound up becoming something of a phenomenon as it inspired countless people living with disabilities. With the original cast back in place, again led by director Charles Martin Smith, Dolphin Tale 2 offers a continuation of Winter’s tale. It debuts on Blu-ray and DVD on December 9 from Warner Bros. Home Entertainment, just in time for holiday gift-giving. Winter’s partner-in-rehab at the Clearwater Marine Aquarium – an elderly dolphin named Panama – passes away unexpectedly. By law, a dolphin cannot be held in captivity alone. Due to her unique situation, Winter can never be released into the wild. So a suitable female companion must be located, otherwise Winter will be forcibly transferred out of the facility. Dr. Clay Haskett (Connick) and his team, including daughter Hazel (Cozi Zuehlsdorff, also returning from part one), struggle to keep Winter in place. Meanwhile, the facility is charged with a number of violations, including chipping paint that could fall into the water (a serious concern that’s quickly abandoned), by an inspector (Charles Martin Smith). The earnest young man who initially discovered the ailing Winter in part one, Sawyer Nelson (Nathan Gamble, also from the first film), is back as well. He’s granted the opportunity to participate in a prestigious semester-at-sea program that will give him a full scholarship. But it means leaving Winter behind, not to mention a subtly-hinted at (but ultimately undeveloped) romance with Hazel. This time around, the various elements don’t fit together as cohesively. Director Smith is credited with the screenplay this time – perhaps the task should’ve gone to more seasoned writers. Smith gives these characters no life outside of the Clearwater facility. Kristofferson and Freeman are underutilized, the former turning up now and again to give son Clay a pep talk and the latter simply to cheer Winter on. 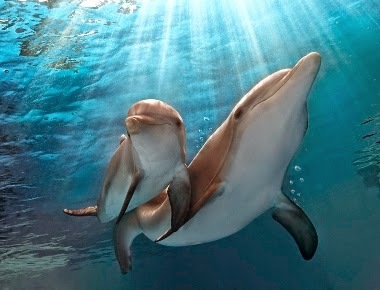 That said, Dophin Tale 2 boasts more terrific dolphin footage, not only of Winter but also of new addition Hope. Hazel and Sawyer have some fun moments with a rescued sea turtle, Mavis (portrayed by an animatronic), and Rufus the pelican. Champion surfer Bethany Hamilton has a small role as herself, getting to spend some time with Winter and the Clearwater team. Best of all is the concluding montage of real amputees visiting Winter at Clearwater. 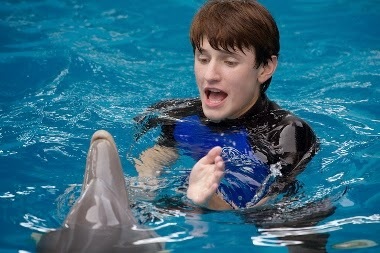 It’s an emotional reminder of the power this dolphin has had in the real world. Warner Bros.’ Dolphin Tale 2 Blu-ray offers an ultra-clear visual presentation. The underwater cinematography is certainly a treat in high definition. A stylized, desaturated flashback sequence early provides contrast with the generally colorful look of the film. As for the audio, the DTS-HD MA 7.1 surround mix offers some pleasingly directional effects during the aquatic wildlife-heavy scenes (i.e. pelican noises slipping out unpredictably from surround channels, etc). Funny enough, some of the dialogue seems swallowed up instead of always ringing out loud and clear. Overall, a very fine presentation. Of the special features, the best item is a funny “Gag Reel” that concludes with a couple of heartfelt speeches, apparently delivered on the final day of shooting. There are several featurettes that all feel a bit too short and too similar, but younger viewers will probably get a kick out of the behind-the-scenes footage. There’s also a pair of music videos, one by co-star Cozi Zuehlsdorff and the other by Gavin DeGraw. The Blu-ray package includes a standard DVD and UltraViolet Digital Copy. Dolphin Tale 2, while not as fresh as the first Dolphin Tale (still available on both 2D and 3D Blu-ray), still retains an easygoing charm. Let’s just hope that if the rumored Dolphin Tale 3 comes to fruition, maybe a little more time is spend developing the human characters.